ROME – At least 40 migrants died after apparently getting trapped and suffocating in the water-logged hold of a fishing boat in the Mediterranean, the Italian navy said on Saturday. The victims are thought to have suffocated after inhaling fumes from fuel after the boat took on water in the hold, the captain of the navy ship leading the rescue said on Italian state television. Commander Massimo Tozzi, speaking from the ship, said that when his men boarded the migrant boat they found the dead in the hold “immersed in water, fuel and human excrement”. Migrants who have arrived in Italy say human traffickers based in lawless Libya charge them between $1,200 and $1,800 for a place on the deck of boats. Those crammed in the hold pay about half as much as those above. Admiral Pierpaolo Libuffo, head of Italy’s rescue operations, told Italian television that 312 survivors had been taken on board, including 45 women and 3 children. He said seven bodies of the dead had been brought aboard the navy ship and some 30 others were still in the hold. The boat was being towed to the Italian island of Lampedusa. Video provided by the navy showed the blue migrant boat, which appeared to be about 20 meters long and made of wood, was still afloat when rescuers arrived. “Either the international community does something to resolve the Libyan situation or this will not be the last tragedy,” Interior Minister Angelino Alfano said. It was the second such fatal incident in the Mediterranean this week, during which about 2,000 migrants have been rescued. Last Tuesday, up to 50 migrants went missing when a large rubber dinghy sank in the Mediterranean Sea. 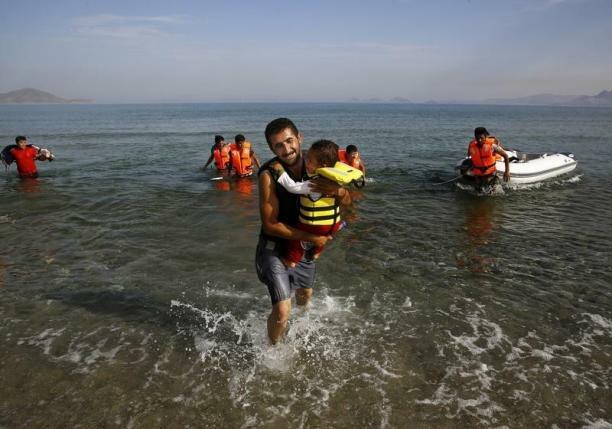 More than 2,300 people fleeing war and poverty have died this year in attempts to reach Europe by boat, compared with 3,279 deaths during the whole of last year, the International Organisation for Migration said. The Geneva-based organization said the number of migrants who have crossed the Mediterranean so far this year is approaching a quarter of a million, compared with 219,000 for all of last year.